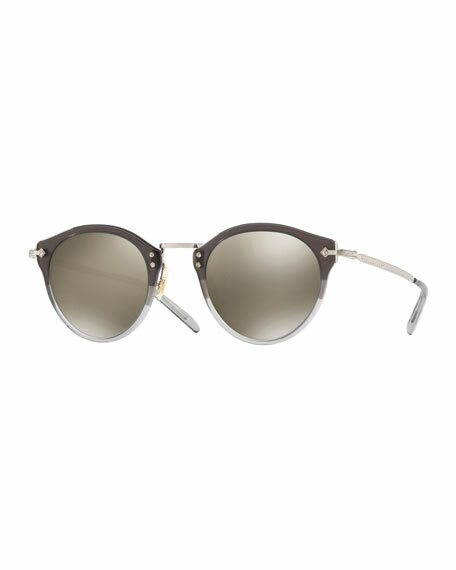 Oliver Peoples two-tone round acetate and metal sunglasses. Filigree detail through temples and nose bridge. Will self-adjust to darker or lighter conditions for the sharpest vision possible. Feature antireflective coating to eliminate bounce-back glare from the inside surface of the lens into the eyes. Include the iconic Oliver Peoples breath logo to assure authenticity. Bari Lynn round sunglasses in aluminum and plastic. Swarovski?? crystal trim at frame front. Gradient lenses. Capped earpieces. Polyurethane case. Bari Lynn round sunglasses in aluminum and plastic. Swarovski?? crystal trim at frame front. Gradient lenses. Capped earpieces. Polyurethane case. Made in USA of imported material. Elizabeth and James "Gilmour" metal sunglasses. Lens/bridge/temple (in mm): 53-16-145. Oval monochromatic lenses. Adjustable nose pads. Slim arms with cutout detail. Transparent capped earpieces. 100% UVA/UVB protection. Attached neck strap with square stones. Imported. Illesteva "Milan3" sunglasses in colorblock in acetate with steel components. Eye/bridge/temple (in mm): 54/23/140. Round, polarized lenses. Single brow bar; keyhole nosebridge. Three-quarter rim effect. 100% UVA/UVB protection. Made in Italy.